Behind the Bit: Caveat Emptor, Saddle buyers! So I'm riding Riley once or twice a week, in my trainer's saddle. I love riding Ri-Ri, and I love that saddle. Did I mention I loved her saddle? It's a County Perfection saddle. I can use the trainer's for now but ultimately I may want to find a used version of her saddle. I'm starting to look around, on Ebay, Craigslist, and in local tack shops. I give high priority to finding a credible seller. 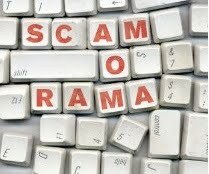 Who would set up a scam using a dressage saddle as bait??? Yet I ran across what I'm pretty sure is a scam. Take a look at these two ads (click to enlarge). The photos are identical. The same photo appears in both of these two classified type ads, even though one seller is based in Tennessee and the other is in Washington state. 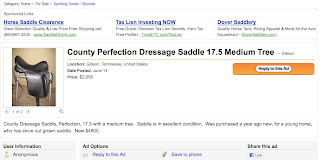 The saddle is listed at about 20% below the typical sales price for a saddle of this make, model, and condition. You know the saying: "If it sounds too good to be true..."
When you look at Ebay, you'll note that conscientious sellers of big ticket items list every little whipstitch and detail. Not much detail in these ads, which when you think of the cost of the item, is kind of weird. Are you skeptical yet? Here's more info. I exchanged email with the seller of the Tennessee saddle. The email identity is Tim; the email itself is signed Sarah. 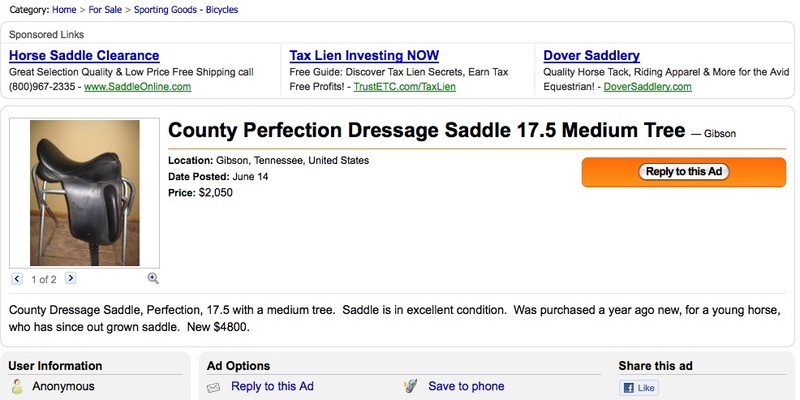 The seller claims to know nothing about the saddle except what is on the ad, which is a little unusual for someone selling a saddle because his/her horse outgrew it. It's a custom made saddle. Wouldn't they know something? "i ship you the saddle you pay for it now and if you're not going to like it or it won't fit you, you'll return it with a full refund policy included"
I suppose it's possible that there is a dressage rider with marginal writing skills selling a saddle for well under market price, and maybe he/she owns two homes in OR and TN. And travels with the saddle. With the horse that's outgrown it. One thing that I've found helpful when shopping for a saddle online is to ask for additional photos. Specifically, ask for a view or closeup they haven't pictured. If they actually own the saddle and are looking to sell it, most people won't object to taking a quick shot and emailing it to you. Yup, asking for extra pics is a good way to be sure the seller actually has the item, but as an eBay seller I beg you to ask enough in advance of the end of auction to allow time for pics to be taken and uploaded. Someone else does that stuff for me, so it isn't an immediate process! What to ask for? Maker's plate, billets, and gullet usally require more pics be taken. Actually, if the sale is made by PayPal, you can be insured if the deal goes sour. I've had one bad EBay transaction and eBay made the seller give me a full refund. But, you do have to be careful in the first place so you don't get scammed. Sometimes the sellers represent other people...kind of like agents...and are just the shippers, not the original owners. In the meantime, have you considered an Ansur? The Excel dressage saddle is fabulous and you will not have to do any stuffing adjustment for Riley as he develops his dressage muscles. It's worth a look to try one. While I have sold two of my saddles through eBay, I would never personally buy a saddle from there. I have had great luck with tack stores Trumbull Mountain and Pelham Saddlery. They both sent me saddles, I got to ride in them, and then send them back when they did not work. (I recently tried six saddles.....finally found one that worked!) Usually on eBay it is a final sale and well, you can get the scammers like you aptly illustrated. You might want to contact Sara Ivie of County, they always have a few demo's on hand, last I checked they had a perfection in those spec's. Sounds a lot like the person who tried to buy the close contact saddle I had for sale. But only if I'd pay $2,000 up front for "shipping" and hand it over to their third party shipper, then wait to be reimbursed. Oh, and the money was in my PayPal account, I just couldn't see or access it until I'd completed the above steps. Riiiiight..... Good to hear that you're being sensible and taking note of the warning signs, some people will apparently do anything to make a buck! I've actually bought and sold saddles a few times on eBay. Most recently I bought a Wintec dressage saddle on eBay from someone local, I was able to meet her at a local shopping mall to pick it up. The saddle didn't work for my horse and I so I re-sold it through Craigslist for what I bought it for on eBay. I also recommend Trumbull Mountain Tack Shop. Their saddle trial policy is hard to beat and you can send them wither tracings to help fit your horse. Tell them that you are fitting a young horse who may fill out and they will certainly have some sound advice for you. 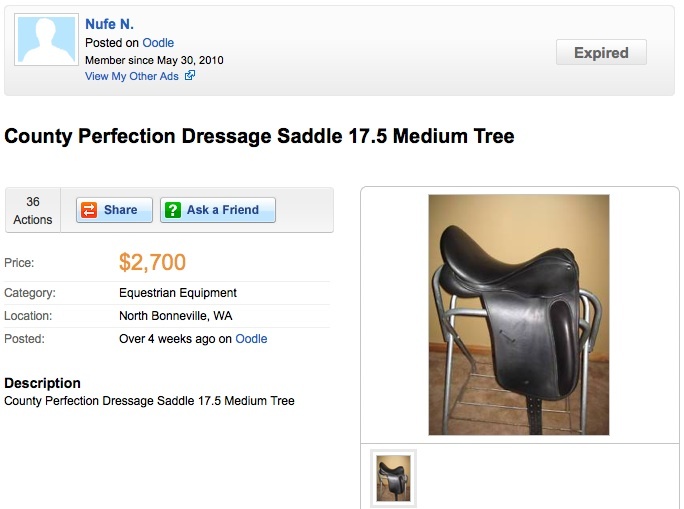 I bought an expensive, barely-used, gorgeous dressage saddle on Ebay. It was the correct size for me and my horse and a big-name brand. Turned out to be a year-long mistake that cost me time, money, frustration, and worst of all, my horse's comfort and musculature. Did I mention that the saddle had HUGE thigh blocks...uh, never again. One good thing that came of it is that I know much more about saddle fit and I am fascinated by this topic. I also know the joy of riding in a saddle that really fits me and my horse. Please, do not even think about purchasing a saddle unless you can try it on your horse and take a ride. Sometimes this is possible on Ebay, you just have to make an agreement before purchase. Is it possible to report this seller? It reeks of scam. I know that sites like Dreamhorse let you report scams. I agree about Trumbull Mt. Very helpful people when you are ready. I have a County Perfection and LOVE it!!!! Cant say enough good things about it and there are many people in my barn with them also and they all LOVE them too!!! I'd bet money the person who wrote that email is Chinese and doesn't speak English as a first language. I've done a lot of shopping with people in Taiwan and that letter just screams Taiwan to me. Crazy, people will scam over anything. Jean, I haven't had good luck getting refunds from Ebay. If the seller withdraws money from his account, Ebay will not pay, even when their guarantee says they should. Ha - yes, I've seen that three times while looking for a used Schleese... if there's a serial number like Schleese uses, make sure you ask for it. I HIGHLY recommend FineUsedSaddles.com - had great service with them. Still don't have my saddle tho. Ordered a custom, and its been three months. Between them and Schleese I swear no one wants to sell a 4K$ saddle.... WTF?